Phylogeography is one of the recent scientific areas emergent from the dissemination of highthrouput technologies of sequencing starting in the 90’s of the XXth century, with the consequent development of intra-specific genetic variance analysis and its geographic distribution. The analysis of phylogeographic data allows to study the processes of population differentiation and the underlying evolutionary and demographic history. Applications of this body of knowledge go from conservation genetics to the study of the evolution of species and populations. This course is aimed at students and professionals that intend to get started on phylogeographic analysis as well as researchers already with some experience that want to deepen or update their knowledge in the field. The course involves theoretical classes as well as hands-on practical sessions using software. Participants are encouraged to bring their own sequence data for analysis. This course can have a recognition of 6 ECTs for FCUL PhD students enrolling in it as part of their first doctoral year. For FCUL PhD students only requiring 5 ECTs recognized in their specific PhD programmes the last 6 hours of the course are not mandatory and the certificate will be on 'Topics in Phylogeography’. Introduction the Phylogeography, basic concepts and problems. Databases for population studies and types of data sets for analysis etc. Short description of statistical methods and principles necessary for understanding the analytical methods used in Phylogeography. Trees and networks. Population structure and analyze of molecular variance. Introduction of themes related to the coalescence theory, genetic demography and landscape genetics. Detection and selection and demographic change with molecular data. 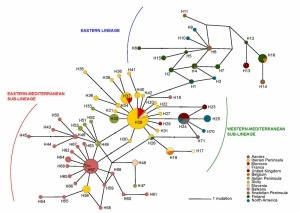 Regional analysis of diversity and of the factors that determined or modified that diversity. Genetic effect of contact between populations. Student of the 1st year of Doctoral programme Biodiv (FCUL/FCUP), Biologia (FCUL) or BEAG (FCUL or UA)?